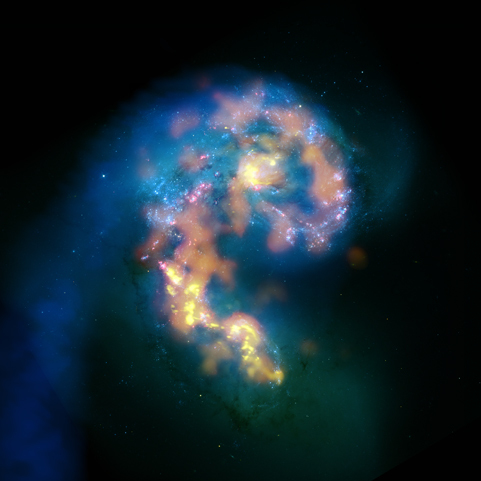 The Antennae Galaxies: CREDIT:NRAO/AUI/NSF; ALMA (ESO/NAOJ/NRAO); HST (NASA, ESA, and B. Whitmore (STScI)); J. Hibbard, (NRAO/AUI/NSF); NOAO/AURA/NSF. The stunning landscape of Chile’s Atacama desert in the Norte Grande is now home to one of the best views in, well, the Universe. The world’s biggest astronomy project – the Atacama Large Millimetre/submillimetre Array (ALMA) – has set up a powerful new telescope which can see millions of light years into the coldest, darkest recesses of space. The Atacama is well known as the driest desert in the world; not great for picnics, but perfect for astronomical observation thanks to its high altitude, nearly non-existent cloud cover, dry air, and lack of light pollution and radio interference. The first images captured by the new telescope – of the Antennae Galaxies, a pair of colliding galaxies with dramatically distorted shapes some 70 million light-years away in the constellation Corvus – are available on the ALMA website. Good write up on the telescope. That would be a great place to visit if one ever gets to Chili.